Novotel Phuket Karon Beach Resort is only 10 minutes drive from the Patong Area. The Phuket family resort is just across the road from the Karon Beach. Novotel Phuket Karon Beach Resort and Spa is the perfect resort for a fun and relaxing holiday in Phuket. It is the ideal Phuket Family Resort with seven different room types. This Phuket Family Resort offers space and freedom for all type of guests. You can chill out next to one of the three pools while the kids enjoy Kids World. You can also pamper yourself at the In Balance Spa or get in shape at the 24-hour open fitness center. 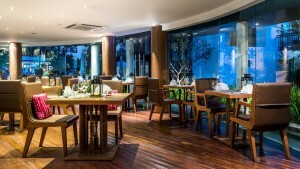 With five different dining options to choose from, Asian to International dishes, there is more than one way to satisfy your appetite at the Novotel Phuket Karon Beach Resort and Spa. 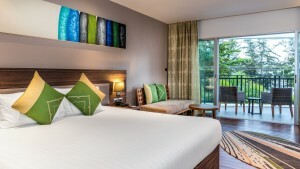 Novotel Phuket Karon Beach Resort is only ten minutes drive from the Patong Area. The Phuket family resort is just across the road from the Karon Beach. Our rooms are designed for couples and family of all sizes. The room types include Standard, Superior Deluxe, Family Fun, Romantic Plunge, Suite, Family Fun Suite and Plunge Pool Suite. From casual poolside dining at Joe Kool’s to delicious Thai and regional cuisine at the Tai restaurant, a wide range of dining options are available in the resort. With a fitness center, kid’s club, three swimming pools and a water slide – there is something for everyone. Book Online Now to get the best packages and deals. Phuket Family Resort Water polo, Walk on Water or Fun Boat are among the favorites. Located next to the children’s pool is the Kids World, the home of family fun. Kids with their family can enjoy fun activities such as face painting, candle color gel making, origami and more. If you are looking for day tours, places like big Buddha, Karon market and Chalong temple are easily accessible from the resort. The hotel also offers special family deals on food and beverages. Check out our offers page to find out the current promotions. See for yourself why the Novotel Phuket Karon Beach Resort and Spa is one of the best Phuket Family Resorts. Hotel Special Offers and Deals are available for accommodation, spa, restaurants, and bars with the easy online booking process.